Don't get me wrong, I've pre-ordered the new Assassin's Creed Revelations game and I can't wait for the multiplayer, which I thought they did amazing with in Brotherhood. I just have to say it, I'm a little disappointed with the multiplayer characters you can pick from this time around. They all just kind of blend together in my mind. We have lots of angry, bearded, robed guys now, as well as plenty of angry, slightly less robed girls too. They don't stand out to me, and it's because I can't read them. Looking at them I have no idea what they do, how they act, or how I should feel playing as them. They look nice, visually fitting with the new setting for the game, but I don't pick up any visual clues about them. I can't seem to stress it enough, we've got different clothing, different weapons, different body sizes, but something is missing. 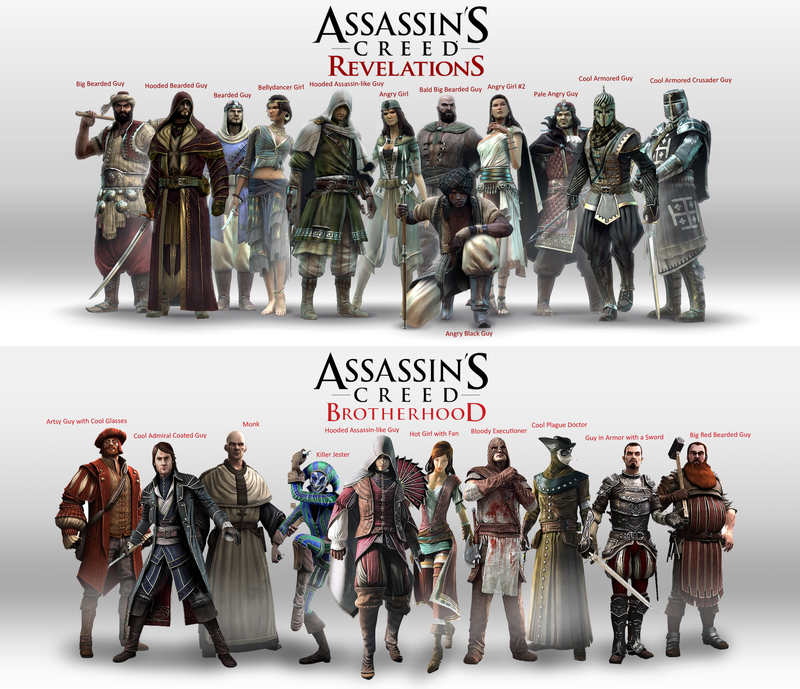 If you look at the Brotherhood characters it is very easy to pick out difference, pick out character, pick out which ones you want to play as. 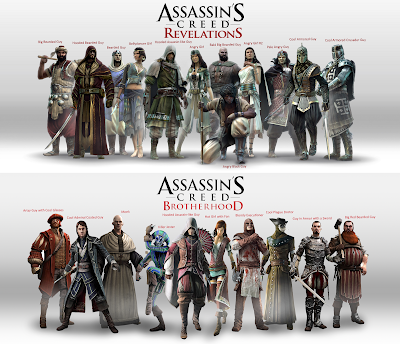 The Brotherhood characters look like characters, interesting people I want to play as. Do I want to be the grinning masked jester, or the burly bearded black smith? For Revelations I've got to choose between from a crowd of unfamiliar people, that look like they should be NPCs, not my list of choices for assassins. Click the image for a closer look or get a closer view of the comments from my deviantart page.